Every day is a great day to serve your community. Unfortunately, as college students, we do not always have the time and resources to engage with the local community. Many of us work and study during the week and may do more on the weekend. However, thanks to an initiative passed by Congress in 1994, the Martin Luther King Jr. Federal Holiday is designated as “a day of service.” It’s next Monday. The Corporation for National and Community Service is in charge of leading this annual initiative from their Washington, D.C. headquarters. The Engage Lead Serve Board, Martin Luther King Jr. Scholars Program and the Phi Beta Sigma Fraternity have partnered to lead this initiative on campus. The president of the MLK Scholars Program, Kayla Payne, thinks this is a great way to start the new semester. “This service event is not only a great start to this new semester but it really does challenge the student body to take the initiative to be intentional with the time they are not in the classroom,” Payne said. King is one of three figures in american history to have a national holiday in his namesake. 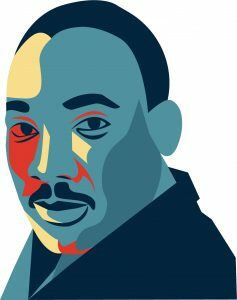 King was a leading figure for nonviolent activism during the Civil Rights Movement and was at the forefront for ending legal racial discrimination. Payne believes this day of service is a perfect way to celebrate the life and legacy of King. “I am a firm believer that we owe it to ourselves to give back to our campus and off-campus community and there is no better way to do that than to unify the student-body and celebrate the life of such an influential leader,” Payne said. King’s “Beloved Community” seeks for the end of poverty, hunger, homelessness and any forms of racial discrimination, bigotry and ignorance. When we engage with our community in a selfless manner, we begin to break down barriers that divide our community. In that effort, we strengthen our community. Engaging in service also has a tendency of empowering individuals. Not everyone has service experience and community service can be a step out of their comfort zone. Challenging yourself to step out your bubble of privilege will build character. As outlined in our mission statement, the University of Louisville seeks to provide engaged service and outreach to improve the quality of life of our local communities. As students, we must realize that we attend this university to gain a “true education”. “The legacy of Dr. King is ingrained in the idea that as students we have a responsibility to grow within our academics but we are equally responsible for finding that the power in our education is only as strong as the character we foster along the way,” Payne said. Next Monday you should go to the SAC Multipurpose Room (MPR) at 10 a.m. to sign up for a service site. Not only do you get free food and a free shirt, but also a chance to make a lasting impact in your community and within yourself.